Some of Australia's best Oysters are found along the Eurobodalla Coast in New South Wales. The pristine turquoise waterways that weave in and around the Eurobodalla Coast are credited with producing the Sydney rock oysters described by a seafood expert as the best in the world. Australians don’t have to travel very far to eat oysters that are described by an expert to be the world’s best. Located in the South Coast region of New South Wales, around four hours’ drive from Sydney, the Eurobodalla Shire is known as the land of many waters. It is also in the heart of Australia’s Oyster Coast, where the oysters tumbled with the tides are indeed considered world-class. Australia’s own seafood tsar John Susman declared to us that oysters from the Eurobodalla region are “the best in the world”. As the founder of Fish Tales consultants, chief oyster judge at the Royal Agricultural Society of NSW (RAS) and chair of oyster judges at the Sydney Royal Fine Food Show, Susman knows his way around a bivalve mollusc with an irregular shell. So when Susman makes such a momentous call, it’s worth taking note. Despite the fact that Doyle has only been farming on the Clyde River for the past four years, his Sydney rock oysters were declared the Champion Aquaculture Product of the Year and Champion Sydney Rock Oysters at the Sydney Royal Fine Food Show in 2017. Collison’s Sydney rock oysters from Comerong Bay Oysters also won gold at the RAS Sydney show. As chief judge of this year’s oyster shucking competition at the annual Narooma Oyster Festival, Susman has slurped his fair share of oysters from the Eurobodalla region, which comprises 130 kilometres of coastline, 83 beaches and four pristine rivers. “The microclimate on the Eurobodalla Coast is what defines the oyster’s characteristics. It’s the oyster’s merroir (like terroir for wine); the flavour-defining characteristics that makes this oyster so special,” he says. What is it about the Eurobodalla? Australia’s Oyster Coast is made up of eight estuaries including the rivers Clyde, Shoalhaven and Crookhaven, Wagonga Inlet and Merimbula and Pambula lakes. 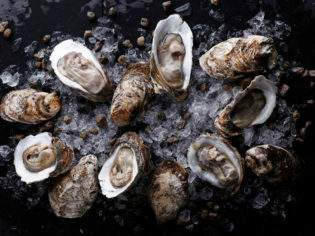 The premium oysters grown in the region include Sydney rock oysters, Angasi oysters, and Pacific oysters. Chef Colin Barker, of The Boathouse on Blackwattle Bay, one of Australia’s best oyster restaurants, says he would recommend oysters from the Eurobodalla Coast because it’s the spiritual home of the oyster in NSW. “It’s a combination of savvy farmers and a pristine environment so it stands to reason you are going to get a good oyster,” he says. 1. Join Captain Sponge’s Magical Oyster Tours with local grower Brett “Sponge” Weingarth to learn about how oysters form as they tumble in the tide. 2. Detour to Wheelers Oyster Farm to shell out for the Sydney rock oysters the family have been farming in Merimbula Lake since 1927. 3. Beer buffs and oyster aficionados should make a beeline for Longstocking Brewery, which is all about bivalves and beer or The Whale Motor Inn Restaurant where the oysters are indeed a primal pleasure. 4. If you want to sample Doyle’s oysters, head to the The East Lynne Store [seasonally available] or book into a luxury glampsite at The Escape on the Clyde River, where you can learn to shuck like a pro. 5. Garry Collison’s oysters are also sold unopened from his shed at Comerong Bay Oysters; BYO shucker. 6. Ralston Bros. The Farm Gate Oyster Bar in Batemens Bay is also a top spot to enjoy the briny flavour of oysters in-situ. 7. The Quarterdeck at Narooma looks out over an oyster lease on the Wagonga Inlet, so it’d be remiss not to down a cheeky dozen from such a vantage point. Visit Australia’s Oyster Coast for more information.